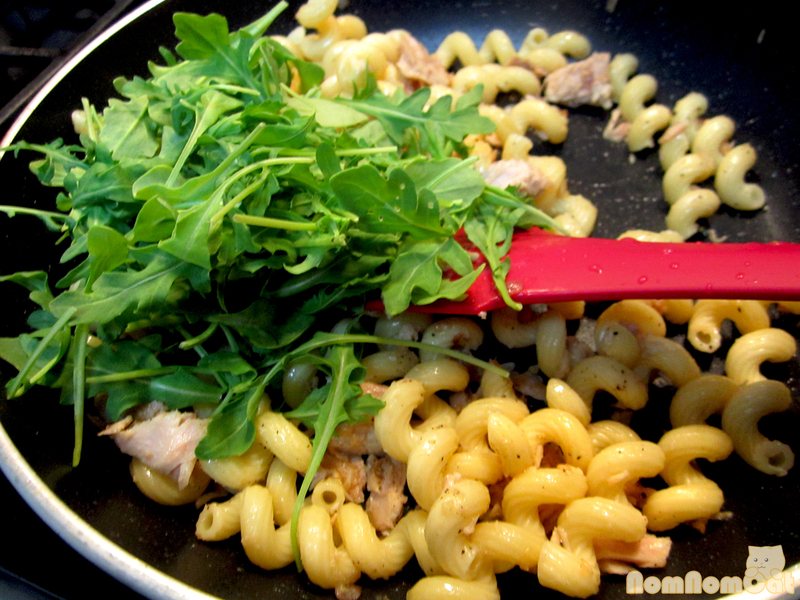 After the success of the bacon & arugula pasta, I thought I’d try combining pasta and arugula again. 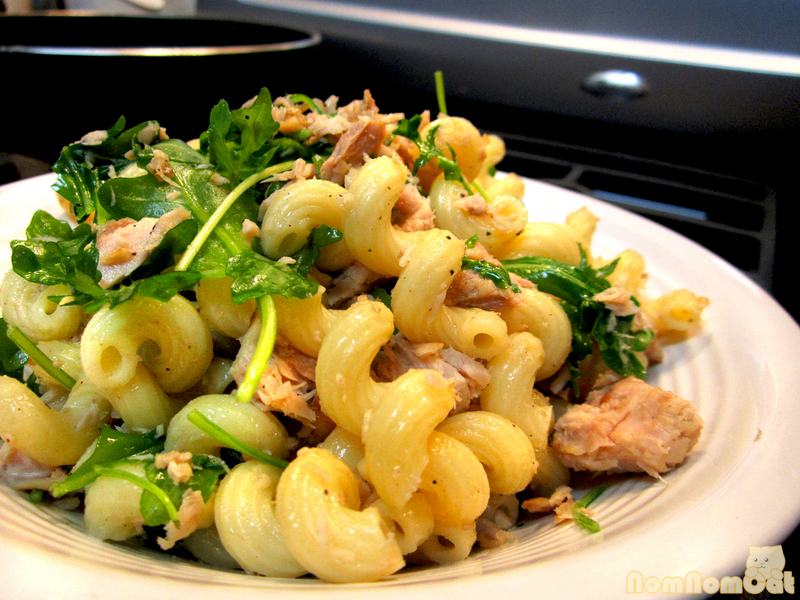 This time, I used a different protein – tuna packed in olive oil, specifically, a fancy gold can of Genova Tonno tuna. And yes, I used cellentani pasta for this one also. That corkscrew shape is just too fun. What follows is a dinner that is perfect for quickly throwing together after a long day at work. It has the comforting familiarity of a tuna casserole without the sodium and fattiness of a canned soup base. Plus, it’s tossed with arugula for a peppery dose of greens. This tuna pasta also keeps well for the next day’s lunch, an important trait we think about when we’re planning out our weeknight dinner rotation. Just remember to get the tuna packed in oil. The kind packed in water (which I usually buy for tuna salad and other cold dishes) will get mushy when you try to saute it. 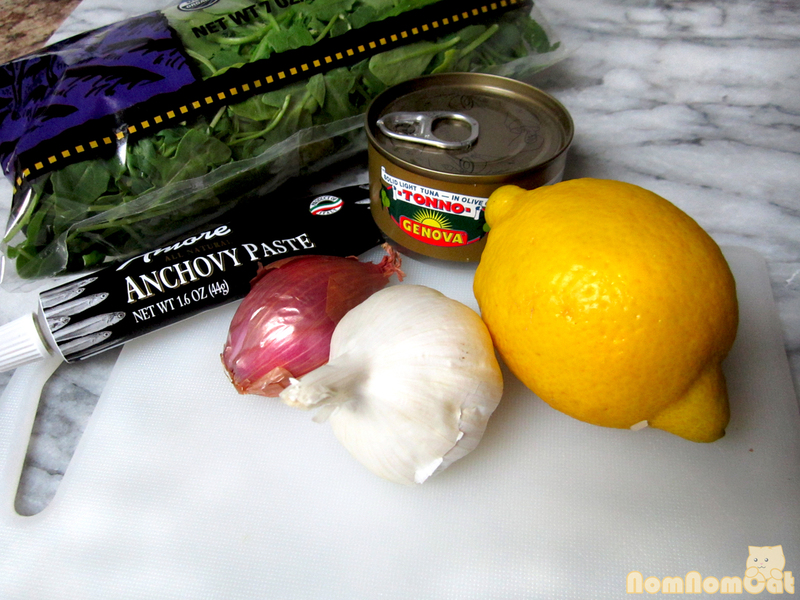 Another key flavor enhancer is the anchovy paste; I used to be able to find it only in Italian grocery stores or fancier markets like Gelsons, but lately I’ve seen these tubes sold at our local VONS and Ralphs as well. It’s worth the investment – the tube will keep for months in the refrigerator and the fishy paste is great for adding an umami quality to Italian dishes. Step 1: Cook the pasta according to package directions. Drain and set aside. Meanwhile, heat the olive oil over medium heat. 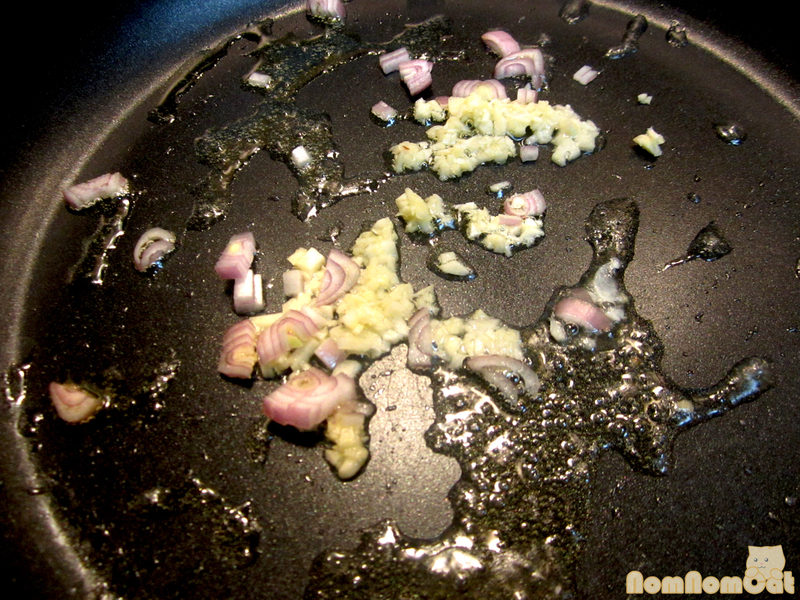 Saute the garlic and shallots until the garlic is a light brown color and the shallots are translucent. 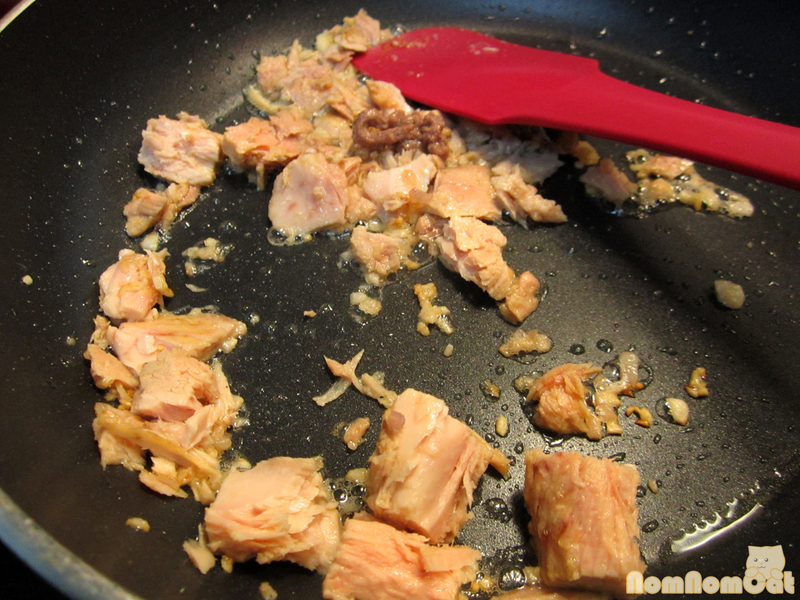 Step 2: Drain out some of the oil from the canned tuna and add the contents to the pan. Stir to break up the chunks. Add the anchovy paste and saute for a few minutes. Step 3: Add in the pasta and stir to combine. Season with black pepper (plenty) and salt (just a bit, as the anchovy paste will naturally add plenty of saltiness). Just before serving, toss in the arugula and mix until wilted. Drizzle with lemon juice for brightness. Step 4: Ready in less than 30 minutes, all that’s left is to dig in and enjoy! 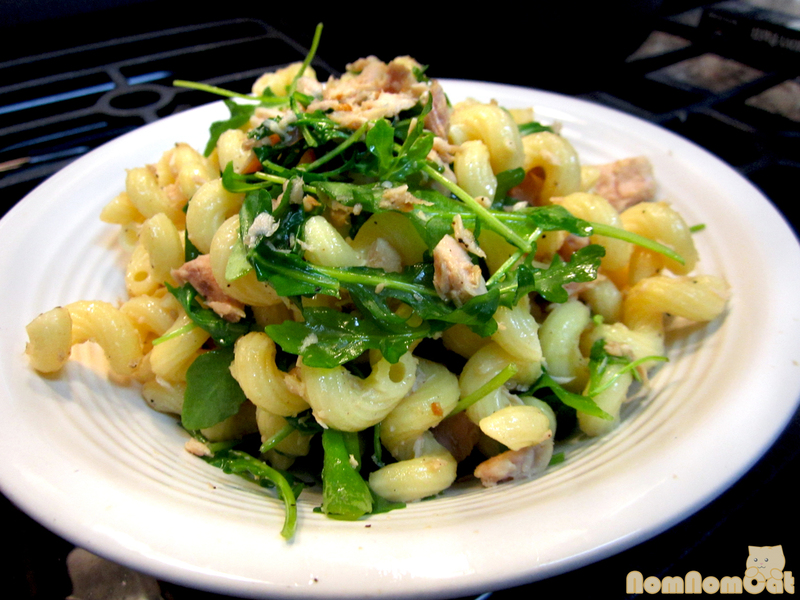 If you’re looking to make an ordinary weeknight dinner a bit more special, this tuna & arugula pasta pairs nicely with a glass of Chardonnay. Serve with lemon wedges for extra zing, if desired. Bon appetit!